Tenacious D are but men (rock!) but that doesn’t mean they don’t sure as hell appreciate women who rock, too. (Hey, these are the guys who brought the world “F Her Gently,” after all). 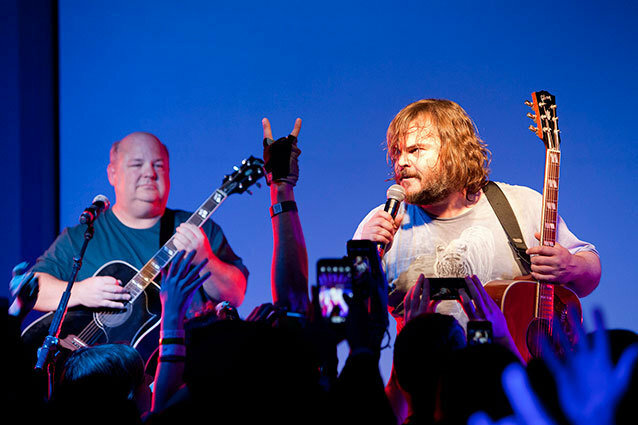 Before hilarious, hard-rocking duo Jack Black and Kyle Gass hit the stage at as Tenacious D at the Yahoo! and Shine America-hosted event at Brazos Hall in downtown Austin, a special screening of the upcoming web series Ghost Ghirls from fellow hilarious duo Amanda Lund and Maria Blasucci was screened at SXSW. The irreverent online comedy, about a pair of delightfully inept ghost hunters (played by comedy partners and real-life pals Lund and Blasucci who got their start, fittingly enough, on the web putting out sketches) is co-produced by Black’s production company Electric Dynamite and the actor/musician/comedian makes an inspired cameo as a 1970s rocker in one of the Ghost Ghirls eps. In fact, Black is just one of the famous faces to pop up in the series, which had a resoundingly positive reaction from the crowd. (Usually “opening acts” can make audiences antsy, but in this case they were too busy laughing at the inane humor in the sneak preview of the web series to notice.) Black’s partner-in-crime Glass pops up, as do the likes of Dave Grohl, Molly Shannon, and Val Kilmer. Yes, that Val Kilmer. It makes sense that Black has his hand in something like Ghost Ghirls, which is directed by Drunk History‘s Jeremy Konner. It is as irreverent as it is downright silly (in one episode, the girls track a ghost that turns out to be nothing more than faulty electrical wiring) and is quick-witted without taking itself too seriously. And much like Tenacious D, Lund and Blasucci balance each other out nicely with their own quirks and delivery. (Blasucci is more of the dry one, while Lund goes for bigger comedy). Of course, Black’s praise of Lund and Blasucci was hardly the only thing to rock: Tenacious D put on a sweaty, loud, hour-long set that couldn’t even jade the most jaded industry types. Come on, how can you not sing/laugh/dance along to so-wrong-they’re-right songs like “Low Hanging Fruit,” “Senorita,” “Roadie,” and, of course “F Her Gently”? While Black admitted he was exhausted from touring, you wouldn’t be able to tell: the road-tested act put on a fun, unpretentious show for SXSW. Ghost Ghirls will debut on Yahoo! this summer. Tenacious D will be touring internationally through the spring and summer.